Sliding down a snow covered hill on a sled is pure fun. Kids love it. Adults love it. Dogs love to chase the sleds. Sledding--a winter activity that always brings smiles. And ice skating? Gliding across the frozen surface is pure exhilaration. In Northern Michigan, sledding and ice skating is waiting for you. Get the sleds out, sharpen the blades on the skates, put on the cold weather clothes and head to hills! Kiwanis Park in Harbor Springs has a sledding hill, space for beginning skiers and snowboarders, and warming hut at the top of the hill where parents and grandparents can watch. Kiwanis Park is located on Arbor Street off of Lake Street and is open 3-8pm Fridays and 12-8pm Saturdays. 231-242-0591. The Harbor Springs SK8 Park is located on Main Street at the top of the hill heading into downtown Harbor Springs. The parks are open Monday-Friday 3-8pm and 12-8pm on weekends. From January-March, free ice skating lessons are offered every Saturday am from 10am-noon in 30 minute sessions for beginners and intermediates. 231-526-0610. 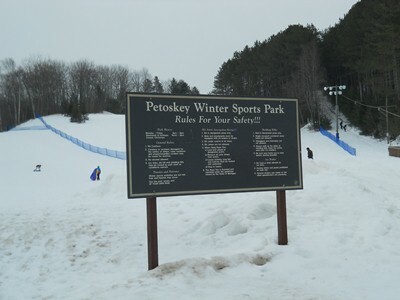 The Winter Sports Park in Petoskey has been the place for family winter fun for 80 years. The park offers a sledding hill and beginning ski and snowboard hill plus an ice rink. The warming hut at the bottom of the hill is a great place for hot chocolate in between sledding runs. The warming house is open Monday-Friday 4-9pm and 12-9pm on weekends and holidays. The Winter Sports Park is located at 1100 Winter Park Lane. 231-347-1252. Boyne City's Avalanche Mountain Preserve is a year 'round setting for hiking, biking, disc golf, sledding, and ice skating. The preserve's 300 wooded acres turns into a winter delight when the snow covers the grounds. Sledders and skaters can sled or skate at any time and the warming house is open 4-9pm weekdays and 11 am-9 pm on weekends. Avalanche Mountain Preserve is located at 1129 Wilson Street. 231-582-6597. Charlevoix's Mount McSauba has been greeting winter lovers since 1956. Families come to downhill and cross country ski, sled and ice skate. And the view from the top? Stunning! It offers six runs, four rope tows, lighted skiing and a free-lighted sledding hill. Sledders, skiers, skaters, snowboarders, snowbladers and snowshoers all head to Mount McSauba. Equipment is available for rental. Hours are Monday-Thursday 5-9pm, Friday 6-9pm, Saturday 12-4pm and 6-9pm, and Sunday 12-5pm and 12-8pm during Christmas vacation. Mount McSauba is located at the corners of Pleasant Street. and McSauba Road. 231-547-3267. 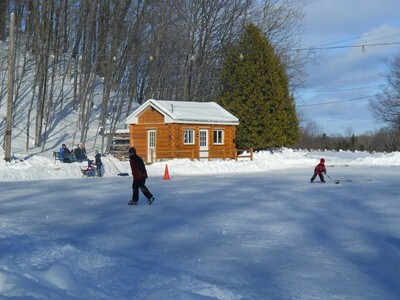 Walloon Lake has a new outdoor rink this year on the waterfront next to the Barrell Back restaurant. Free skate rentals are available. The rink is open daily as weather conditions permit.